Click on a picture to see photos, video and audio of past performances. Check back often... we are adding new content to the most recent recording sessions as the videos and audio are polished up! Tim McNary was gracious enough to come play at studio ON, quick on heels of his west coast tour. A few pounds lighter and the owner of memories of unfamiliar towns and new faces, dimly lit with neon bar signs, Tim drove from Nashville to Roswell, Georgia, with his friend and fellow songsmith, Sean Quinn. We greeted in person for the first time. There was a strange feeling that we had known each other for years. That feeling only comes easy over strangers when there is a kindred spirit or a common understanding of something at a level that seems to escape the general populous. For us it is the love of music. Everybody loves music… but we are talking about something deep, profound and visceral. Sean Quinn opened up with 6 songs, most of which were light and humorous but with more and more review, alone in post-production, the songs revealed to me profound social commentaries that I think even Sean may deny as intentional. Sean is working things out and using music as counselor and couch. “The Old Man and the Sea” was a much more direct impact for any father or son and the experience left me staring in retrospect at the mixing console, long after the song was over. Tim’s performance was nothing short of moving. Sean’s guitar work and backup vocals put the finishing touches on each piece in a tasteful, subdued manner that made the finished work better than the sum of the parts. You forgot you were at a show listing to a live performance and found yourself transported to places that were familiar yet you’d never been before, experiencing events that seemed like they were in your distant past or within a spell of déjà -vu. That’s what sincere songwriting and an intimate performance does for the artist AND the audience. Both are edified and leave with an experience that cannot be force-injected by any music machine. Click the picture above to see some video and listen to the tracks from Tim and Sean’s performance at studio ON. With some gritty guitar, smooth bass and a drummer that can play a room, Brit, Michael, Justin and Josh served up some thoughtful songwriting to an audience that anticipated a unique show... and the guests got what they came for. Watch the video for "Olde Country" and listen to the track for "Drinks on Me" and you'll see that these artists have a range that will keep you on the edge of your seat. What a great night with Brit La Palm & the Barrel Fever! "There really is something special happening at studio ON. From the band perspective, it was a rewarding experience from start to finish. Chris was truly engaged with us as musicians and actively tried to tap into who we are. That level of understanding isn't found at any other venue anywhere. 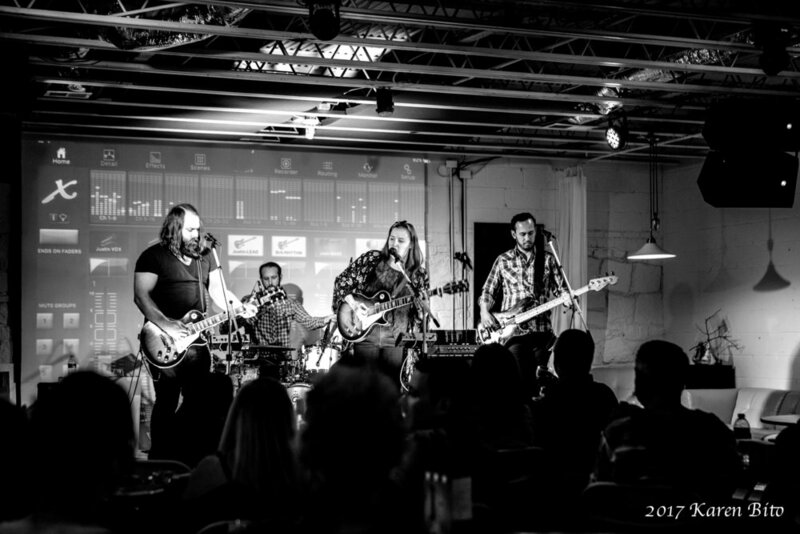 The stage was perfect for an intimate setting and really allowed for us to connect with the audience." "Studio ON has ruined me - I don't want to go anywhere else to hear music. A true listening room at it's finest. The sound was incredible. It is truly a testament to quality performers and a sound technician that not only knows what he is doing but obviously cares that he gets the best sound possible. Nice people, nice venue." Poverty Level put on a wonderful show in March, 2017. Their music comes from years of songwriting in the hills of western Virginia and evolved with their relocation to Atlanta, Georgia. You can tell JD and Phillip have spent years working together as JD's rhythm guitar, filled with intricate licks that just seem to stream from his fingers mingles so nicely with Phillips strong vocals. Dan (guitar) and Jeff (bass) brought it all together with their exceptional talent. Another success at studio ON! "AMAZING AND INSPIRING ! ...that's what you come away feeling after the experience with Studio On. From the moment we stepped in the venue we knew it would be special...we had no idea how moving for us the show would actually be. As many artists have said before us, this is one of the best shows we've EVER played!! Regarding the sound, lights, general atmosphere, the way we felt after it was over and especially the local support that comes out to participate you could not ask for anything more." The Lively Exchange gave us a wonderful taste of Americana music wrapped in a fresh, new package. Gritty vocals and harmonies reminiscent of the kickin' it on the back porch with a few guitars and your buds... contemplative, personal lyrics... exceptional musicianship... If you missed it, check out the audio and video from their performance in August 2016. "Studio ON really is the best kept secret in the Atlanta area. Musicians and music lovers alike will be challenged to find a better venue." The Jason Connelly Band (Jason Connelly and Benny Kriff) showed us what heart and soul sounds like. Jason's personal lyrics and soulful voice and Benny's melodic guitar leads combined to be one of our best shows yet. Listen to the tracks and check out the interview on their dedicated page. Click the picture to link! "Absolutely love this venue and the people who run it! It's so hard to find a venue that TRULY respects the artists, but this one not only respects the artists but makes them feel appreciated as well. A true gem." Christy Clark was the 2nd season winner of the acclaimed Sing For Your Life competition in Atlanta. This session was her original music debut and she did bring it! Be sure to check out the emotional closing song "Waiting All My Life" in the audio section of her page. The show opener was the illustrious Barry Brandon, one of the creators of Sing For Your Life. You can also hear three of Barry's tracks and one of songwriter JL's solo songs... click on the picture! What a great show with this group of artists! First set was called "Sunday Morning"... a little on the mellow side. Second set was "Saturday Night" when they brought it full force. Power vocals from Laura Deese, bass lines that never heard of a root note or a whole note from Bill Taylor, shredding guitar from Kyle Bryant, sax way beyond normal talent by Derron Nuhfer and holding down the fort with tastey drumming by Mike Davis. You missed it but click on the picture to see some images, video and a sample of audio from the show. "Amazing venue, amazing people, amazing experience. As a musician, this ranks as one of the coolest shows I've ever played. The audience was packed with people who love music and listening intently to every sound coming from the stage. The sound quality was superb. Chris Grubb runs a world-class venue and has created a very unique experience for both the musician and listener! You really have to experience it, to fully appreciate it. Now go buy some tickets to the next Studio On show before that one sells out!" Sami Michelsen and Sean Michelsen head up the band, Alchemy. Their acoustic performance at Studio ON was one to be remembered. Edgy then moody then strong vocals... the skilled touch of the guitar strings... transcendent songwriting... this duo could have played till dawn and we would have still been enthralled in their art! Their live show was hosted in January, 2016. We had a special opening act with Talan Davis, an exceptionally talented singer and songwriter. Indee Killed the Pop Star joined him on a couple of tunes! "We had an amazing time playing Studio ON. It was a rare and unique opportunity to connect with music lovers while also giving them a look into the record-making process. It was a rewarding experience, and one of those shows we'll look back on fondly for years to come." "I have to honestly say, this HAD to be the best musical concert experience I've ever experienced in my entire life as a performing musician. All our friends, family and fans were absolutely thrilled! A lot of them commented on how this was our best show to date and just how beautiful the venue and the whole experience was!" "Great venue and audience to play for! Think of Studio On as a more intimate indoor version of Chastain Park. If you are an artist wanting to get your music out there, go play there. If you are an avid artist supporter or a person looking for an enriching evening, go to a show there. I love the concept of Studio On. Chris is terrific to work with." "Amazing staff and crew at studio ON. The entire day from soundcheck to the show was such a great experience. And a huge thank you to each and every person that filled up that room and gave us such great energy to feed off of." "Brilliant concept... great music and acoustics... stellar atmosphere! Cant wait until the next event!" "As a musical artist, I have to say the venue is so sweet. Acoustics are incredible and Chris does a magnificent job assuring the sound is perfection. The concept of Studio On is brilliant!"